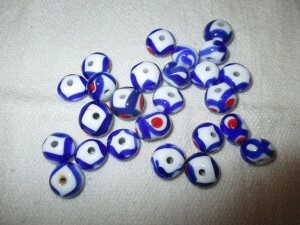 Beads from a Kent cemetery used by the King’s head retainer for the bead game. Part of 300 site tokens. 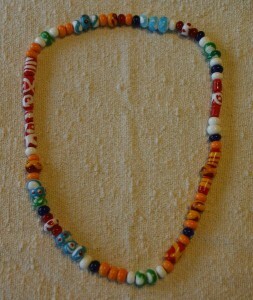 A&S token, appear to be a mix of commercial and handmade beads. 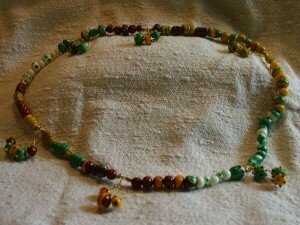 My favorite Anglo-Saxon necklace with beads from a cemetery in Kent. Early Anglo-Saxon necklace given to a friend. I learned to make lamp work beads about 12 years ago. I pull out my equipment every once in a while and have a great time. 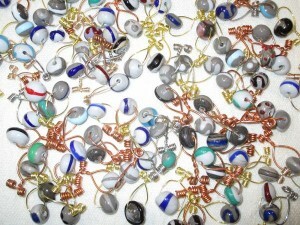 I have made site tokens for several events, A&S tokens, 4 Anglo-Saxon necklaces and designed a bead game. I am going to start this page about the bead game. If it sounds like something your group would like to do, just drop me a note and I will send you more information. Unfortunately our Barony is getting a little small and we need a little help to run an event. I designed the bead game to do just that. Through out the event are small bowls with handmade beads in them. Each bowl has a note that asks you to do something, for example empty the trash, compliment somebody in the A&S area or wash dishes. 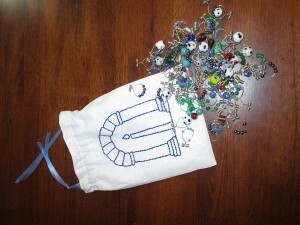 The Baron, Baroness and Autocrat have a bag of beads each. Their beads are fancier and they are harder to get. Frequently the Autocrat has the best beads because it takes a brave person to offer to do whatever the person in charge needs to be done and should be well rewarded. Do a good deed and get a bead. 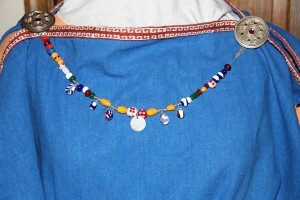 Child’s necklace with my heraldry.